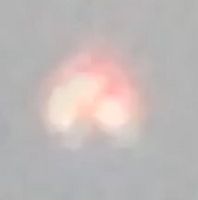 Latest UFO sightings – Daytime UFO video of somekind of triangle shaped object flying over Melbourne, Australia. This footage was recorded today – Saturday, 7th August 2010 at 12 pm. What do you think of this formation? Could this be just a birds? Perhaps a kid air ballon ? ABOUT THE MELBOURNE SIGHTING.IT SOUNDS LIKE A REMOTE CONTROLLED DEVICE,AS UFOS DO NOT MAKE ANY NOISE,MOST OF THE TIME………….